The studies - which could eventually treat diseases - have been described as clever, important and exciting. Prof David Liu of the Broad Institute said: "We are hard at work trying to translate base editing technology into human therapeutics." "Having a machine that can make the change you want to make is only the start. You still need to do all this other work, but having the machine really helps." 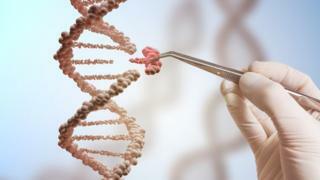 Feng Zhang - also of the Broad Institute - said: "The ability to correct disease-causing mutations is one of the primary goals of genome editing. "This new ability to edit RNA opens up more potential opportunities to... treat many diseases, in almost any kind of cell." Dr Helen O'Neill, from UCL, said: "This is an exciting week for genetic research. "These papers highlight the fast pace of the field and the continuous improvements being made in genome editing, bringing it closer and closer to the clinic." She told the BBC: "We can't hide any more. "The science is moving fast in the sense it is becoming less risky, more certain, more precise and more effective. "It is absolutely past time for us to engage more widely with publics on the issue of gene editing."